Before I break my arm patting myself on the back, let me tell you that I made a huge error. I stopped too soon in my investing education. Instead of continuing to learn, I rested on my investing laurels — and who knows how much money I've lost out on because I forgot that no one cares more about my money than I do. And my huge error led me to make many mistakes. For instance, I didn't realize until (embarrassingly) recently that different funds in your 401(k) have different fees. Selecting funds with low fees can make a huge difference in returns. Or “buy and hold” is not the same as “buy and forget about it.” And then there's the issue of investing and taxes. But doing something (even if I didn't evaluate or understand my choices) is better than nothing, right? So there I stayed, comfortable in my stinky 401(k), letting my financial adviser make fund recommendations for my IRA. Until this year. This year, I vowed to tackle my investing fear and ignorance. I've been reading old posts on Get Rich Slowly, collecting a list of investing books I want to read and perusing investing websites. I've created this list (along with my impressions of each resource) to help me learn more about investing, and I hope it helps you, too. It's not an exhaustive list, of course. Also, in the interest of full disclosure, I get no compensation for including any of these resources. For new readers, I dug through the GRS archives to find some solid investing posts. I wanted the posts to highlight different investing strategies and philosophies. I'm sure I missed a few, but this should save you from poking around the Investing archives — at least a few minutes, anyway. Dividend-paying stocks This is a fairly recent post, focusing on dividend-paying stocks. Roth IRAs Here is a great post on Roth IRAs. Developing an investment policy statement – Before starting to invest, analyze why you are investing. What's the point? Figuring that out first will help you form an investing strategy. How the stock market works – The day this post ran was the day I understood more about the stock market. Sure, things have changed since this 1952 video, but the basics are still the same. DRIPs This post succinctly covers dividend reinvestment programs. Mutual funds Here is a great introduction to mutual funds. Index funds This post describes why many people (including J.D.) have most of their portfolios in index funds. Bonds No list would be complete without mentioning bonds. Mutual fund prospectus Part of becoming an educated investor involves understanding where your money is going. Here's how to read (and understand) a mutual fund prospectus. Best books on investing – This post covers eight well-known investing books, but it's missing some good ones. One of the good ones it's missing is Peter Lynch's “One Up On Wall Street.” It's old, but I like his focus on simplicity and buying what you know. “Control Your Cash” by Greg McFarlane and Betty Kincaid is another favorite. This book actually covers all the usual financial topics (credit scores, buying a car and a house, taxes, etc. ), but has a couple of chapters on investing and securities. What I like about this book is that it explains investing in a way that I can understand, using a writing style that is funny and still pertains to a wide variety of investors. 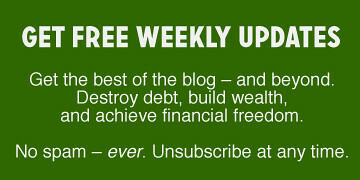 Bite the Bullet Investing This just-launched blog appears to be created for the investing novice. Posts cover terms such as equity and return and topics like using other people's money. Great if you're just starting out. SEC guide Use this guide to learn how to read financial statements. I think this is a very easy to understand set of terms. The Oblivious Investor This site is organized well and Mike Piper writes clearly, without a lot of “fluff.” I found his information on index funds to be easy to understand. I haven't checked out any of his books, but he's written several on various topics. I think he appeals to a wide variety of investors. Seeking Alpha This site has been mentioned several times in the comments of various GRS articles, so I thought it was worth checking out. It covers individual stocks and has some great articles. To read the entire article, you must register (though it's free, I dislike the extra step). If you're serious, it has a Pro subscription service in addition to the free information. I think there is some great information here, but it's too advanced for me at this time. Morningstar has 172 free investment courses. Topics include “Investing for the long run” and “The magic of compounding.” Did I mention they were free? Guide to Transparent Investing Frankly, I'm overwhelmed reading my own list. But if you pick anything from this list, please read this guide. Published in 2007, this 53-page discusses DIY financial planning, risk tolerance, and how to create a portfolio to minimize the bite of taxes. It explains fundamental concepts well and includes charts. I wish I'd read this guide years ago. When doing a list like this, it's so easy to miss lots of great resources. Which ones would you add? Lisa Aberle is a college professor by day and a freelance writer by night. Always an aspiring writer with an interest in money, she once ironically misspelled “mortgage” during a spelling bee. Most of her current adventures take place on the four-acre mini-farm she shares with her husband in the rural Midwest (where she writes with gel pens whenever possible). There are 23 reader responses to "Investing in your investing education: A resource list". I would recommend two books, The Intelligent Investor by Benjamin Graham and Common Stocks and Uncommon Profits by Philip Fisher. These two authors heavily influenced Warren Buffett. So much shade is constantly thrown at Honey, even when its not even her post. Why do people care so much? Another by a Canadian author: Allison Griffiths’ Count on Yourself. “The Intelligent Investor” is a great book, although a bit dry, especially if you’re a novice. I would recommend that you learn as much as possible about value investing and dividend growth investing (a subset of value investing). Once you anchor your investment decisions in actual data about companies, you have the potential to create real lasting wealth and even beat the market. My mom got me started in investing in a ROTH IRA when I was 8. I used the money that I made cutting my neighbors grass. I used that money when I turned 23 and my wife and I bought our first home. You are 100% correct though, investing knowledge is very much a “use it or lose it” skill. Or maybe more accurately, “stay up to date, or be left behind” skill. This is an important comment! An entire article could be written about this, because it is not a known. I had to look it up to see if it was legal–considering you said you were 8. This is a fantastic learning and earning tool for kiddos. As long as you report it, that money is earned income and does, in fact, qualify for a Roth IRA. Congratulations to you and your Mom. I find the research tools at Fidelity (which is where we have our stock investments – in our IRAs) to be very helpful and informative. You pick your expert strategy and depending on the market you get suggestion on stocks that fit that strategy and then you can research those stocks from there. Great breakdown and thank you for the links, Lisa! Great post. I haven’t done much research on socially responsible companies, but it seems like the line between the ones that are and the ones that aren’t is so blurry. If there is enough information on these companies, I will write a blog post on it. I have an IRA at Pax World. It was the first rollover I ever did. It’s been there more than 25 years. They have a lot of information on their website if you want to check it out. Actually I think it would be great material for some posts. Thanks for the list in the post and the comments! Looks like some great resources. I like seeing practical topics like this on GRS. Thank you for posting this list! Every since I started earning money I’ve always shied away from what I considered, ‘the grad school of personal finance’. It always seemed like Greek to me and an easy way to lose everything. Now in my mid 30s I am so far behind where I should be but I guess there is no better time to start than now. If you want to keep investing really simple, “I Will Teach You To Be Rich” by Ramit Sethi is a great personal finance book with strong, concise, clear arguments about why simple investing strategies are far better than most. I would honestly stay away from books like “One Up on Wall Street” by Peter Lynch because it makes stock picking seem simple. That kind of attitude will get most people in trouble. The Intelligent Investor is a great book, but probably not really helpful for most people who just need to learn how to properly allocate their money across index funds, track and rebalance. Good investing is relatively simple. You don’t need to pour through earnings reports or anything like that. Understand asset allocation, pick good index funds to track that allocation, and check in every now and then to rebalance. I agree re: stock picking. I agree that Peter Lynch is entertaining, but if you follow his recommendations you’ll end up primarily in consumer stocks, not always the best play. Also, if you look at the overall performance of Magellan, it did about as well as the S&P 500, in an era when the S&P was pretty go-go, also. It’s easy to look like a genius in an up market. Let me add a recommendation for Rick Ferri’s book, “The Power of Passive Investing”. I would love if you guys would sometimes recommend Canadian resources!